Golden Horseshoe greenbelt legislation that protects 7,200 square kilometres of land from development is being reviewed by the Province of Ontario. First introduced in 2005 to slow urban sprawl and protect agricultural land and rural landscapes on the outer edges of the Toronto metropolitan area, greenbelt regulation has had a profound impact on the region. The real estate market has responded by moving away from suburban subdivision housing and embracing urban intensification, taller buildings, more infill development and less sprawl. 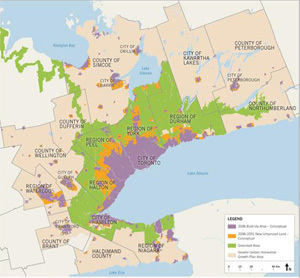 A co-ordinated review of four provincial plans that regulate land use in Ontario’s Greater Golden Horseshoe region is now underway. The Growth Plan for the Greater Golden Horseshoe, the Niagara Escarpment Plan, the Oak Ridges Moraine Conservation Plan and the Greenbelt Plan have worked together to manage growth, protect the environment and support economic development. The Greater Golden Horseshoe is home to nine million people and an economic hub that generates about two-thirds of Ontario’s and one-quarter of Canada’s gross domestic product. It also has some of the country’s most important and productive farmland while hosting many significant ecologic and hydrologic natural environments and scenic landscapes. The region’s greenbelt contains almost two million acres of protected land, making it the largest and most strongly protected greenbelt in the world. It includes the Niagara Escarpment, the Oak Ridges Moraine and land known as “protected countryside” where agriculture is its predominant use. With a projected population growth of 50 per cent over the next 25 years, it will become more difficult to balance the region’s growing importance as a Canadian economic driver while recognizing agricultural contributions and maintaining a commitment to a sustainable natural environment. The Growth Plan for the Greater Golden Horseshoe was released in 2006 and was amended in 2012 and 2013. The 25-year plan’s aims are: revitalizing downtowns to become vibrant and convenient centres; creating complete communities that offer more options for living, working, learning, shopping and playing; providing housing options to meet the needs of people at any age; curbing sprawl and protecting farmland and green spaces; and reducing traffic gridlock by improving access to a greater range of transportation options. The Greenbelt Plan took effect in December 2004 and was established to identify areas where urbanization should be stopped in order to provide permanent protection to the agricultural land base and the ecological features and functions that are part of the landscape. It aims to enhance urban and rural areas and overall quality of life by promoting: agricultural and environmental protection; culture, recreation and tourism; settlement areas; and infrastructure and natural resources. The Niagara Escarpment includes a variety of topographic features and land uses that stretch 725 kilometres from Queenston on the Niagara River to islands off Tobermory on the Bruce Peninsula. The Niagara Escarpment Plan provides direction on how land under its jurisdiction may be used or managed as well as criteria for development of permitted uses. It also sets out policies for the Niagara Escarpment Parks and Open Space System. The plan was originally approved in 1985 and was revised as a result of reviews that were initiated in 1990 and 1999. The Oak Ridges Moraine extends 160 kilometres from the Trent River in the east to the Niagara Escarpment in the west. The Oak Ridges Moraine Conservation Plan grew out of the Oak Ridges Moraine Conservation Act, 2001 and was established to provide land use and resource management direction for the 469,300 acres of land and water within the moraine. A number of studies have found compact urban development can generate significantly lower capital, maintenance, operating and replacement costs for infrastructure, so building more compact communities will require fewer roads, water and wastewater pipes, and other forms of infrastructure. The province is seeking public input on how to effectively achieve its goals at townhall meetings across the region or online. The first meeting took place on March 30. The co-ordinated review will also impact the review of The Big Move, Metrolinx’s regional transportation plan, and take into account support for mixed-use development, multi-storey wooden structures, protection of industrial lands and consideration for planning of complete communities. The review of the four overlapping plans is intended to identify ways to develop responsibly and sustainably while also dealing with increasingly frustrating traffic congestion. The Our Region, Our Community, Our Home document was created by the province to help inform and guide discussions. It describes the plans and its objectives, highlights important policy issues and sets out questions that it’s hoped will be addressed during the review. Comments and ideas must be submitted by May 28. A web page asking for feedback can be accessed here and submissions can also be made through the Ontario Environmental Registry or by sending an email to landuseplanningreview@ontario.ca. Comments will help inform draft amendments to the plans and will be presented at a second set of public consultations later this year.